Equi-Tape is the only elastic therapeutic tape created specifically for the equine athlete. Human Olympians, professional athletes as well as weekend warriors have recognized the benefits of elastic kinesiology tape for years, and now Equi-Tape along with special Equi-Taping methodology is being made available to the equestrian community. Equi-Tape® can be used to successfully treat a wide range of equine conditions and helps give support and stability to joints and muscles while at the same time allowing for full range of motion. 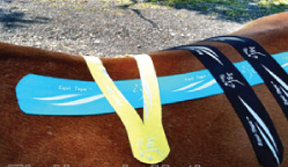 This specially designed tape can be used to help rehabilitate equine injuries, helping horses become sounder sooner thereby becoming an important resource in equine sports management. Please Note: Equi Tape instructions are not a substitute for professional veterinary advice or the services of a qualified taping practitioner. You should consult a professional for best results or with questions. Sold in a roll. Available in Black, Yellow, Red, Pink or Blue.